An innovative ministry of wholistic service has embraced DNA training for its Africa volunteers. For the first time, Mercy Ships sent a volunteer crew to a four-week Worldview and Development training led by Chris Ampadu, West Africa representative for Samaritan Strategy Africa. “We are very excited about this program and we count ourselves as privileged to have this opportunity to serve Mercy Ships,” Chris said. Twelve crew members from Liberia, Ghana, Togo, Benin, and Sierra Leone lived for one month at the Samaritan House Fse-Amasaman campus in Accra. The four weeks included over 50 presentations including all 43 topics of the BASICS 1 course. 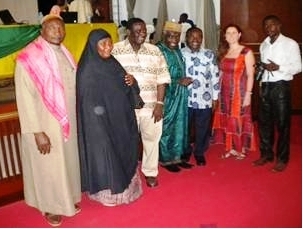 Chris was joined by his Ghana team – Patience Mensah, Nora Naana, Joseph Antwi, and Victor Owiredu as presenters. The trainees celebrated their graduation February 4. “Two guests from the Human Development Deptartment of Mercy Ships joined us to graduate these first crew members from the new Africa Gateway,” Chris said. 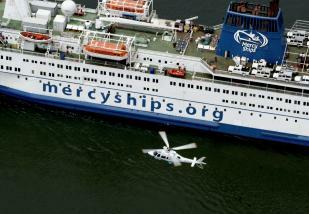 Gateway is Mercy Ship’s term for their training program. DNA founders Bob Moffitt and Darrow Miller have been associated with Mercy Ships for years. More recently, Chris has served multiple times as the main speaker for the ship’s pastors conferences in Liberia, Benin, Togo, and Sierra Leone. “It is just wonderful, the first opportunity to have people stay with me for such a long time and to do a detailed study of these lessons,” Chris reported.